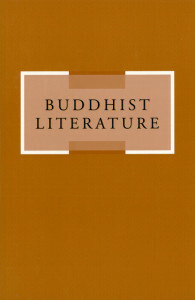 The Journal of Buddhist Literature specializes in the publication of translations of Buddhist texts from any canonic language. The main intent of the journal is to encourage a continued focus on the textual resources of the tradition, the vast majority of which remain unedited, untranslated and unpublished. The Institute of Buddhist Studies is pleased to be able to make online copies of the first two issues available. We hope that these important resources are of use to you in your own work. At this point, the future of the journal is under review by members of the editorial board. Developments will be announced via H-Buddhism.